Supreme Court • Change of guard in Utah judiciary. Al Hartmann | The Salt Lake Tribune Utah Supreme Court Chief Justice Christine Durham gives the State of Judiciary speech to members in the House of Representatives on Monday, Jan. 23. Al Hartmann | The Salt Lake Tribune Utah Supreme Court Chief Justice Christine Durham, center, gets ready to give the State of the Judiciary address to members of the House of Representatives on Monday, Jan. 23. She announced she would be stepping down as chief justice. Justice Matthew Durrant, right, will replace her as chief justice. Al Hartmann | The Salt Lake Tribune Utah Supreme Court Chief Justice Christine Durham, center, leaves the House of Representatives after giving State of Judiciary speech to members of the 2012 Legislature on Monday, Jan. 23. She announced she will be stepping down as chief justice. Justice Matthew Durrant, right, will replace her as chief justice. 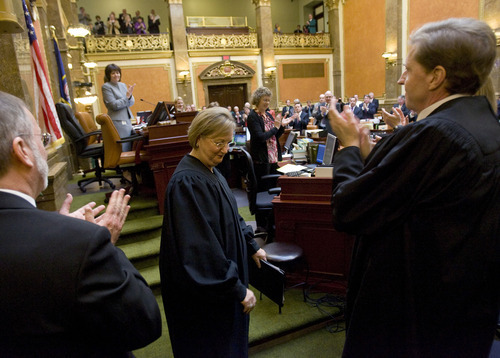 After 10 years as chief justice of the Utah Supreme Court, Christine M. Durham told the Legislature on Monday she is stepping down from that leadership post  but staying on the court. "It is time … for new leadership," she said in her annual State of the Judiciary address. She announced that the court "has unanimously selected Associate Chief Justice Matthew B. Durrant to begin a [four-year] term as Chief Justice beginning April 1, which will give us plenty of time for an orderly transition." She said Durrant is "blessed with great ability, a great intellect, and a great sense of humor. I know that he will provide superb leadership in the years to come." Justice Ronald E. Nehring will become the associate chief justice. 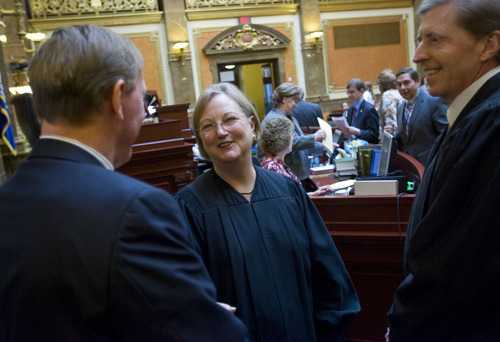 Durham is the first woman on the Utah Supreme Court. 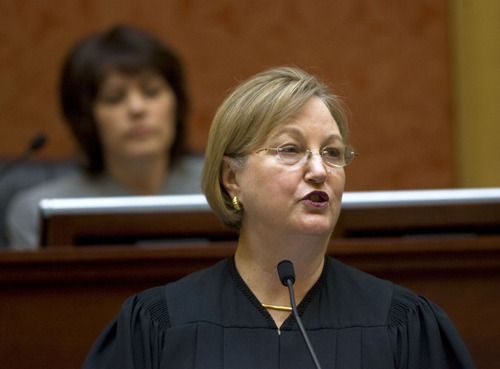 She is the second-longest serving chief justice in Utah's history. Gordon R. Hall served for 10 years and two months in 1983 and 1993, while Durham will have served exactly 10 years. "She certainly distinguished herself as the first woman chief justice," said Utah Bar President Rodney Snow. "She has a national reputation as a jurist, and brought extraordinary prestige to the court." "It will be a real loss for her to go, although I am pleased she is staying on the court. Justice Durrant will also do a wonderful job," Snow said. Richard Howe, who was the chief justice before Durham, called her an "excellent judge," and noted that "she always listened well and takes her time before making decisions." Howe said Durham had a genuine interest in the administration of the courts and excelled at "finding ways to improve their operation." Durham said state courts have made much progress in the past decade, and were often forced by budget cuts in tough economic times to find more efficient and cheaper ways to do business. "I'm inclined to think that, on occasion, a bad crisis is a terrible thing to waste  and Utah's court system has used the stress of recent years as a catalyst for solving problems creatively and perhaps more quickly than we might have been able to do otherwise," she said. Durham said state courts have 20 percent fewer staff than 10 years ago but because of such things as using more electronic filing than paper filing, the courts "have not closed or reduced hours, have not eliminated services, and have not permitted delay to betray the promise of access to justice." She added that Utah courts "have nearly three times the number of cases filed in one year than are filed in all of the nation's federal courts combined." Even with budget cuts made over the past decade, she said, "The courts are not seeking any restoration of lost resources. We are prepared for the time being to function in what many describe as the 'new normal.' "
She did make one exception, however, to propose expanding a self-help center for those who are forced by tough economic times to represent themselves in court. "The existence of fair and impartial courts means little to people who cannot adequately represent themselves. Access means more than just getting in the door of the legal system. It must mean having a fair shot at getting relief," she said. Durham concluded, "It has been my honor and privilege to lead Utah's judiciary through a challenging and productive decade. I am extremely proud to look back at all that we have accomplished, and look forward to all that we are poised to accomplish."